Daylight Hotel is located in Perissa, only 100 meters from the exclusive Black Beach, and features a seasonal outdoor pool and sun terrace. The accommodation has free WiFi and private parking. Suite with a balcony, air conditioning and satellite TV. Soundproof room with 1 double bed or 2 singles, balcony and air conditioning. 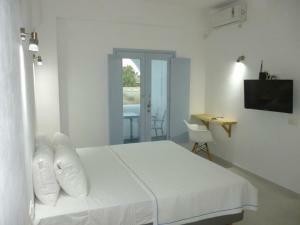 Room with 1 double bed or individual 2, balcony, tiled / marble floor and satellite TV. Soundproof room with 1 double bed or 2 singles, balcony and cable TV.